I knew right away what I wanted to do with this sketch, and that so rarely happens to me. 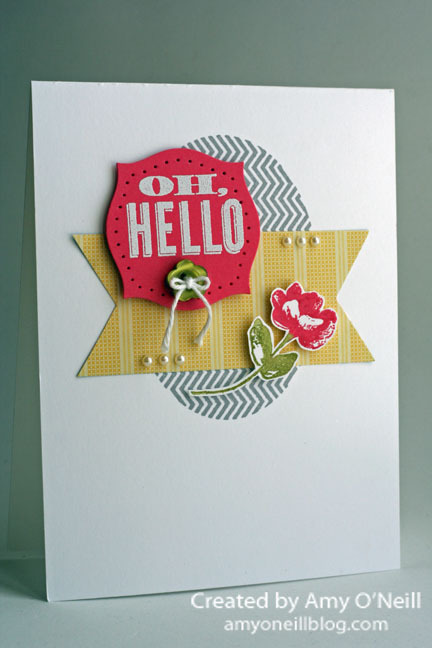 Continuing on with my theme of showcasing retiring products, I pulled out my Oh, Hello stamp set. 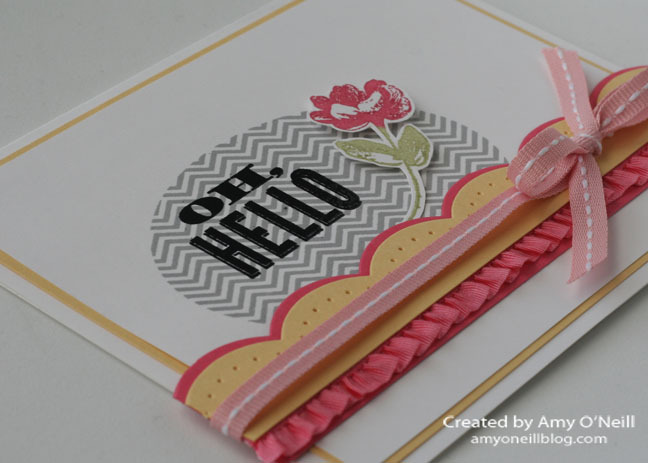 I just love that chevron oval, and the pretty flower, and the fonts on the sentiments. I will miss this set! 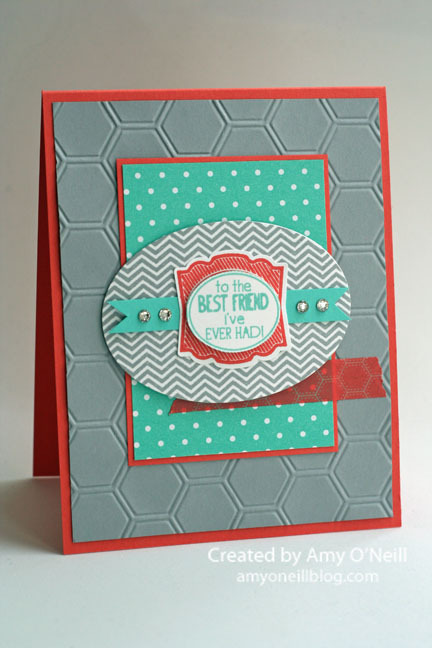 I embossed the sentiment with Black Stampin’ Emboss Powder. The two types of ribbon I used — Strawberry Slush 3/8″ Stretch Ruffle Trim and Blushing Bride 1/4″ Stitched Grosgrain ribbon are both also retiring. 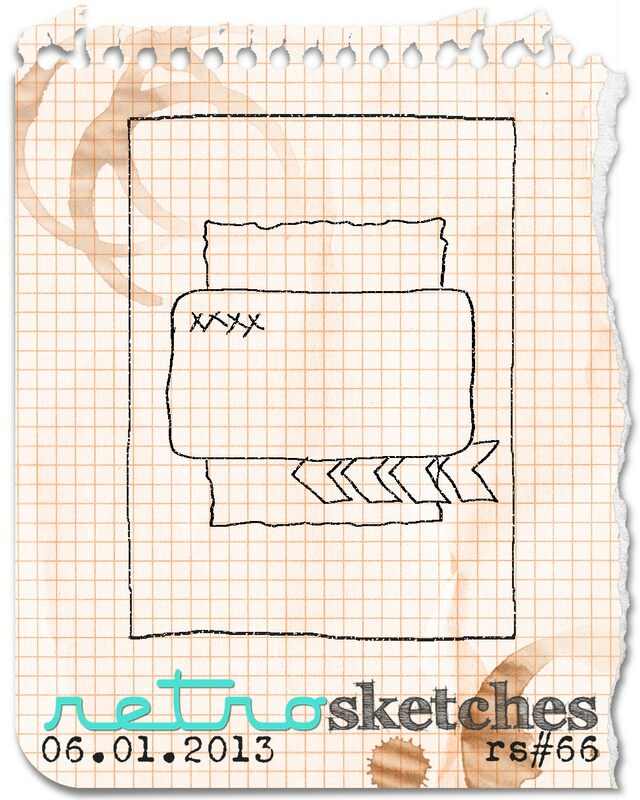 We hope you’ll be able to play along with us this week at Freshly Made Sketches. Go check out what the rest of the design team did with the sketch at the Freshly Made Sketches site, and then link up your creation there. I thought this card was very true to my style. 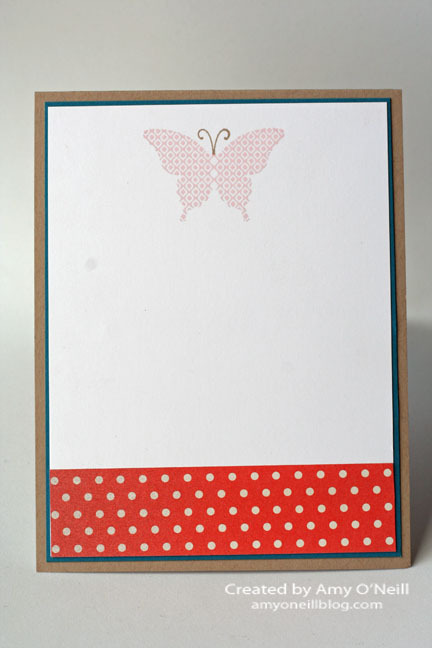 For the butterfly, I die cut a piece of cardboard and then applied some Whisper White craft ink with a sponge dauber. I then glued down some of the Glass Stampin’ Glitter on the butterfly. Next on the blog hop is Breelin Renwick’s blog, or you can work your way backwards and visit Wendy Weixler’s blog. Enjoy your Wednesday night! Thanks for stopping by! Welcome! 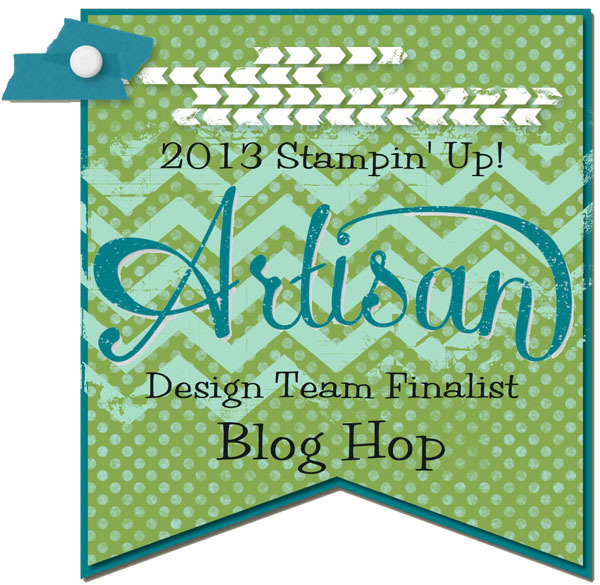 We’re on day 2 of our Artisan Finalist blog hop. The ten finalists who were not chosen to be on the design team are sharing our ten projects. My project today is a scrapbook page. 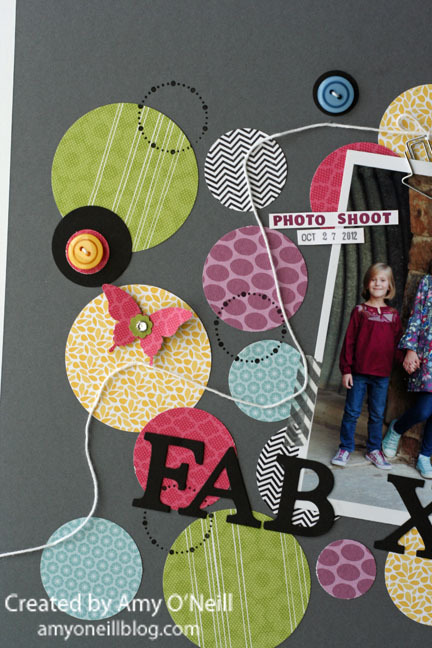 Scrapbooking was my first love when it came to paper crafting. I love to do it, but find that I don’t do it very often anymore. It’s just so much quicker to make a card. 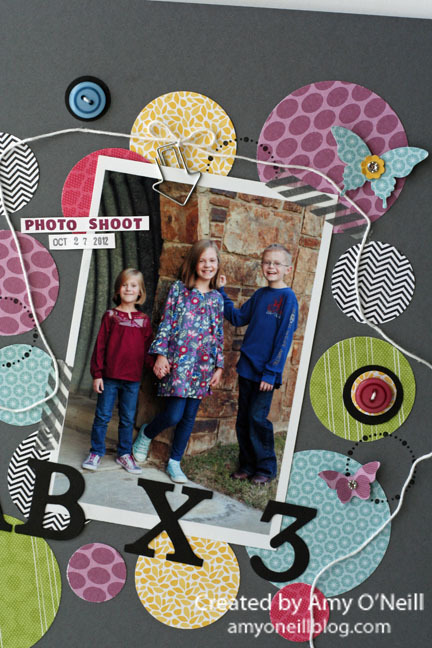 Making the three required scrapbook pages is always my favorite part of this contest. This page was actually pretty simple to make. I just used lots of circle punches. Punches make everything easier! 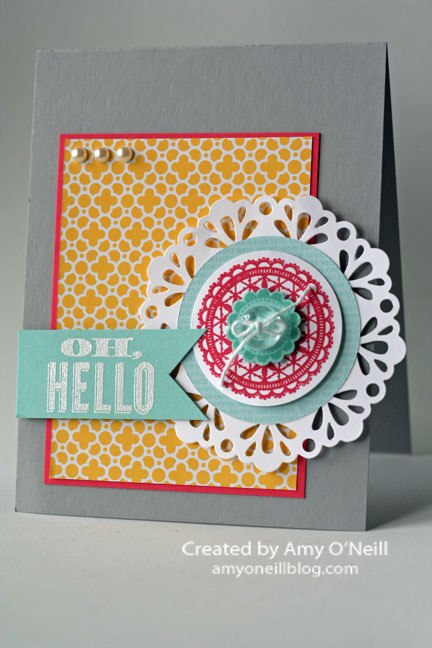 I stamped over some of the circles with a stamp from Circle Circus (now retired). I also added some washi tape to the photo. This is an older picture of my three kids that we took for a Christmas card one year. I love this picture of them. Because I made this page back in May, before the new catalog was released, I have used some retired products (mainly the dsp and buttons). 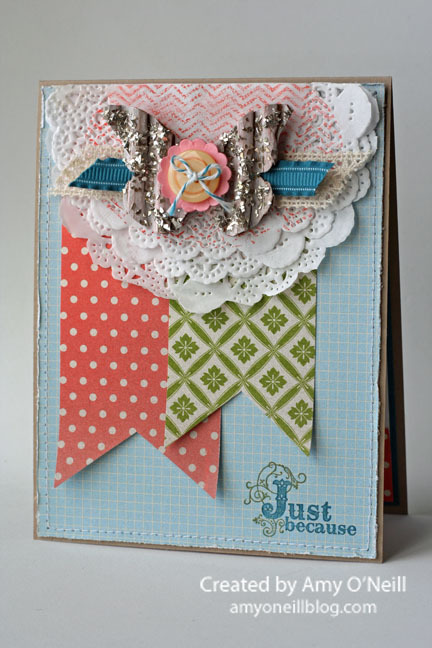 Now you should hop on over to Breelin Renwick’s blog and see her fabulous creation! Or you can work your way backwards and visit Wendy Weixler’s page. Either way, you’re sure to see something beautiful! Two posts in one day! That’s unusual for me. Well, I’m back for the second time today because those of us who were chosen as Artisan Award Finalists, but didn’t make the design team are doing a blog hop over the next ten days to share our projects. We each made ten projects — 5 cards, 3 scrapbook pages, and 2 3-d items, and we all put a lot of work into these projects. I hope you’ll follow along the blog hop trail and check all of them out. There are some truly amazing projects made by some amazing artists to see along the way. My first project is a card. This was actually the first card I made. I made it back in February and was going to use it for one of my regular blog postings. But then I thought that maybe I should set it aside just in case I decided to enter the Artisan contest again. If only I had done that with all of my other projects! By the time May rolled around (the deadline to enter was May 22), I had only done this with two cards and still had eight projects to go. It seems like I never decide to enter until the last minute. Life would be so much easier if I planned ahead. Well, now you’re ready to hop on to the next blog, which is Breelin Renwick. If you’d rather go in reverse order you can do that too, and go visit Wendy Weixler. Either way, you can make a full circle and visit all ten blogs with the click of a button. Some of the products I used on these Artisan entries are now retired, as I made all of these projects before the new catalog was released. Enjoy your Saturday evening! I’ll be back tomorrow evening (and the next eight evenings after that) with another Artisan project. Thanks for stopping by! I’m still playing with some of the new colors. I had some Coastal Cabana on my desk from yesterday, so I decided to try some other combinations that go with that color. The Color Coach suggested Calypso Coral and Smoky Slate, and since I love both of those colors, I thought the combination sounded great. 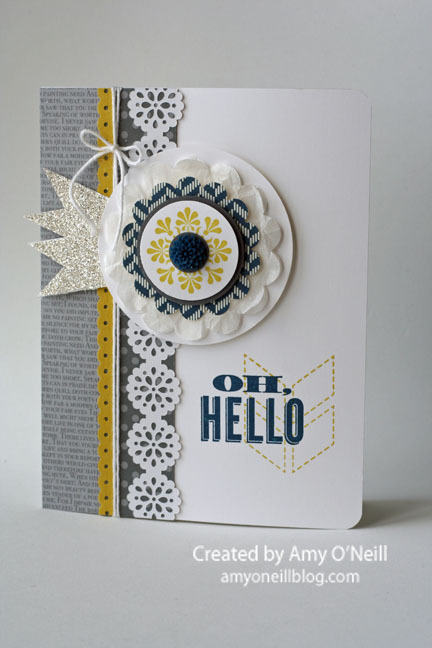 I used a little mix of old and new on this card — some new colors (Strawberry Slush and Smoky Slate), some new dsp (Quatrefancy Specialty dsp), and some old favorites (Large Delicate Doilies Sizzlits die, Delicate Doilies and Oh, Hello stamps). Today is the day when you can order from the new catalog. Yippee! Today is one of the last days that you can order from the old catalog and the Spring catalog as well. Sounds like a great day to order to me! I hope that over the next two weeks you’ll be able to join us at Fab Friday with this challenge. Go check out what the rest of the design team made at the Fab Friday site. I’ve been having fun playing with some of the new In-Colors which will be released on May 31. I’m trying to figure out what color combinations I like, and I found one today that I really like — Strawberry Slush, Daffodil Delight, Smoky Slate, and Old Olive. I think Strawberry Slush will be a favorite color of mine. My posts have been a little irregular lately, and they will probably continue to be so for the next couple of weeks. I apologize! 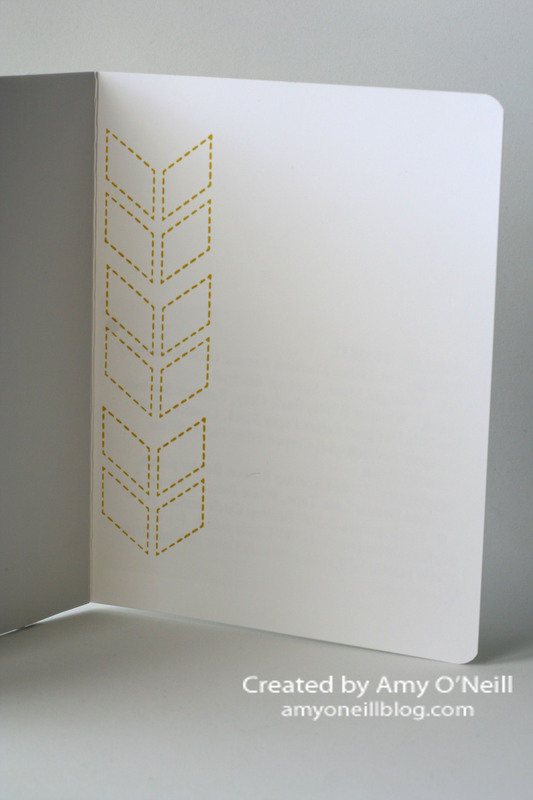 I’ve been working fast and furiously on some samples for the display boards for Stampin’ Up’s convention in July. I have a short turn-around time and I have a lot to get finished in the next two weeks. I can’t show you what I’ve been working on now, but after Convention I’ll have a lot to share with you.